Monsignor Guido Marini (born 31 January 1965) is a Roman Catholic priest, currently serving as the Master of Pontifical Liturgical Celebrations. He was appointed to this post on 1 October 2007, replacing Piero Marini (no relation). He previously served as chief liturgist for the Archdiocese of Genoa. Guido Marini assisting at a Papal Mass with Pope Benedict XVI. In a speech given in January 2010, Marini supported calls in the church for a "reform of the reform" of liturgy. He said during the talk, "For some years now, several voices have been heard within church circles talking about the necessity of a new liturgical renewal," adding that a new renewal movement would be "capable of operating a reform of the reform, or rather, move one more step ahead in understanding the authentic spirit of the liturgy and its celebration." In May 2010, Marini celebrated Mass ad orientem at the altar of Mary Salus Populi Romani in the Basilica of St. Mary Major. In 2015 Pope Francis made changes to the public ceremony of investiture of the pallium on Metropolitan Archbishops emphasizing that the investiture is an ecclesial event of the whole diocese, and not merely a juridical or ceremonial event. Monsignor Marini said that from now on – starting from 29 June this year – the ceremony of investiture of the pallium will take place in the Metropolitan Archbishops home dioceses and not in the Vatican. Marini has received praise for returning traditional elements of the church's liturgical history to the papal Masses and other liturgical celebrations. 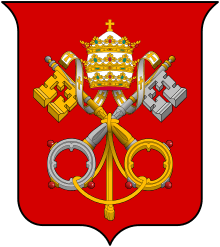 During his time as Master of Ceremonies Pope Benedict ceased to use the papal staff made for Paul VI, and began to use an older one made for Pius XI (pictured). 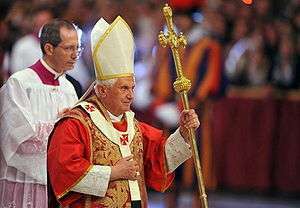 Due to the weight of that staff, Benedict had his own made which is much lighter, and shares a similar style with the previous one (Pope Francis occasionally makes use of this one also in order to emphasize continuity with his predecessor). 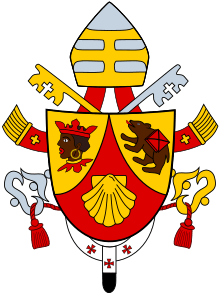 He also made decisions about the use of papal vestments at Mass and other pontifical celebrations, dressing Cardinal-Deacons in dalmatics when serving pontifical celebrations. He has touched on themes such as the proper orientation in the liturgy, the primacy of Gregorian chant and Renaissance polyphony as a "permanent criterion" for sacred music, forms of liturgy, sacred art and architecture, receiving communion kneeling and upon the tongue, the hermeneutic of continuity, silence, and many other aspects of liturgy. Marini, following his appointment as Master of Pontifical Liturgical Celebrations, restored some traditional elements of papal ceremonial. During his time as Master of Ceremonies the Papal Altar was rearranged. The seven candles and crucifix were placed in a line across the Altar rather than clustered on the sides. This arrangement has become known as the "Benedictine arrangement". As Master of Ceremonies, Marini, while not a cardinal-elector, had duties during the 2013 sede vacante and at the 2013 conclave which elected Pope Francis. On 11 March, the day before the conclave, at a ceremony presided over by the Camerlengo Tarcisio Bertone, Marini himself led the non-cardinal officials, support staff and other non-elector personnel with duties in the conclave in taking an absolute oath of secrecy pertaining to the conclave. On the opening day of the conclave, after the cardinal-electors had taken the electors' oath in the Sistine Chapel, Marini called out the command "Extra omnes" (Everybody out) and closed the chapel doors once all outsiders had left the chapel. ↑ "News Features – Catholic Culture". Cwnews.com. 1 October 2007. Retrieved 7 March 2013. ↑ "CNS STORY: Papal liturgist endorses 'reform of the reform' of the liturgy". Catholicnews.com. Retrieved 7 March 2013. ↑ "Normas Nonnullas No. 46–48 English text". Vatican.va. Retrieved 2 February 2014. ↑ Non-voting participants in conclave take oath of secrecy (Television production) (in Italian and English). Rome: Rome Reports. 12 March 2013. Retrieved 2 February 2014. 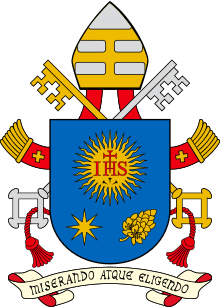 ↑ Conclave oath of secrecy (Television production) (in Italian). Rome: Catholic News Service. 11 March 2013. Retrieved 2 February 2014. ↑ "Notificazione Giuramento degli Officiali e addetti al Conclave (Oath of the Officials and the Employees at the Conclave)" (in Italian). Vatican.va. Retrieved 2 February 2014. ↑ Procession and entrance in Conclave (Television production) (in Italian). Rome: Centro Televisivo Vaticano. 12 March 2013. Retrieved 9 April 2013.